In the Barkor area just after dawn, a devout man fixes one of his wooden "gloves". 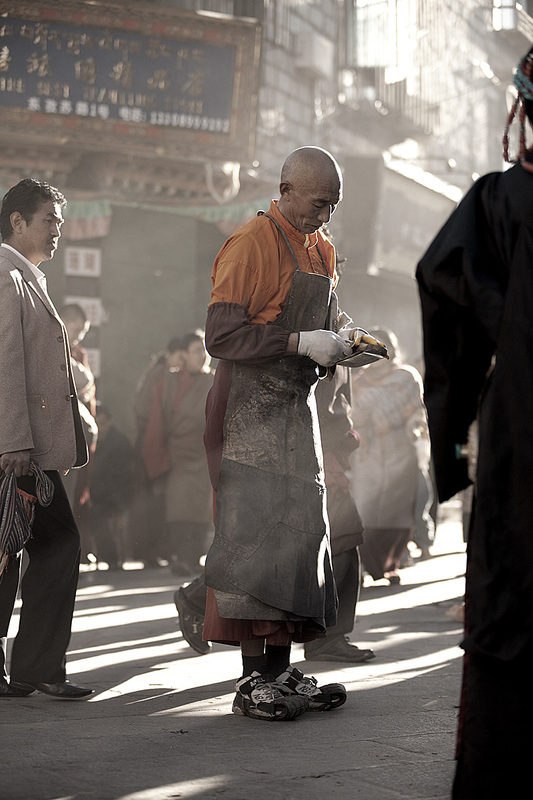 The front leather apron and wooden "gloves" protect his body from repeated contact with the ground while he loops the sacred temple a few times on hands, knees and stomach. Stay tuned for tomorrow when I'll post a photo of the same man but in the prostrated position. Is there a better photo than this one? Thanks, Crowder. I'll assume you meant to place an exclamation point at the end of that sentence and take it as a compliment :-) otherwise, I'm not sure how to answer that question. Dust is usually the enemy of the digital photographer and may the gods have mercy on your sensor if you decide to change lenses in this type of environment. However, in some cases, dust provides that necessary umph in a picture. In this case, without dust in the air, there would be far less visible dramatic lighting.